The Scoop & Learn Ice Cream Cart is a nice treat for the little ones. While they add scoops of ice cream to a neat banana-split counting tray, they will be sure to smile and giggle as it counts for them. This is the type of toy that will help build a variety of skills, like fine motor skills. For example, as they squeeze, scoop and play, they will be working on fine motor skills. With the Scoop & Learn Ice Cream Cart, children will learn how to appropriately follow directions. The scooper will give instructions on what to do and they will be required to follow them. The Scoop & Learn Ice Cream Cart will help teach the little one the process of ordering. As an adult, this is a process many of us know all too well. This is a skill that the little ones should learn at an early part of their life. This way, when they’re the appropriate age, they will know how to place their own order and mesmerize the waitress. This will also help improve their social skill. 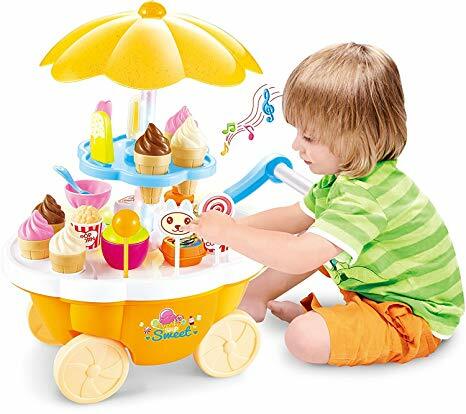 Another neat aspect is the fact that when little ones play with the Scoop & Learn ice cream cart, they will be using critical thinking skills. You see, they will be running their own ice cream shop – yes, it’s imagination, but they will feel as if they are special and actually running their own shop. Speaking in imagination, that is another aspect the ice cream cart will bring out in your child. You can rest with the satisfaction of knowing that when you get this ice cream cart for your little one, they are going to have a large amount of fun with it. In fact, it may be hours before they decide to call it a day and once they are one playing with it, they will be all tuckered out …because you know, it takes a whole lot of work when you’re running your own ice cream shop, right? The Scoop & Learn Ice Cream Cart is a toy that little ones will enjoy – this is the type of toy they will wake up and want to play with.